. He is commonly known to the public as a powerful mage called "The Salamander". But this title has started to fade as the series progresses. 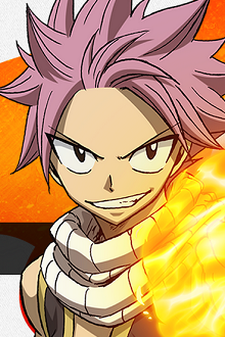 Natsu's most prominent features are his spiky rosy-colored hair and his signature scaly white scarf which may have been given to him by Igneel. Natsu has a scar on the right side of his neck which may be the reason he wears his scarf almost all the time. How he got the scar is yet to be revealed. He has no separate eye color, his eyes instead being solely the color of his black pupils. Natsu is of regular height, and his body is toned but not noticeably muscular. His member's stamp is located at the top of his right arm, just below his shoulder. Natsu has a carefree and reckless nature and, despite his constant brawls with the other members of the guild, is a fiercely loyal and protective friend. He has a particularly close, and competitive relationship with fellow members; Gray Fullbuster and Erza Scarlet. With the former, he has had a constant rivalry from a young age and although they often denounce each other as not being friends, they regularly watch each others' back even when they are enraged with one another. He has had the same sort of relationship with Erza - the two both being scared of her since a young age - and they seemed to have a fairly good relationship in the past as, according to Erza, they used to shower together. He befriends people rather quickly too, considering Lucy a friend and willing to team up with her only after a few days of knowing her. Natsu's father had left him when he was young. Igneel, a dragon, found him in the forest and ended up taking care of him. He taught Natsu how to speak, read, and use magic. But one day Igneel disappeared. This made Natsu look forward to the next time that they would meet. It is hinted that he has strong feelings for Lucy, as pointed out by Happy when he said that Natsu cried at the thought of Lucy leaving.